this callus remover is specially designed for the callused feet or heel. Please do not use it on other parts of the body. Do not turn on the device if the roller has not been placed properly. 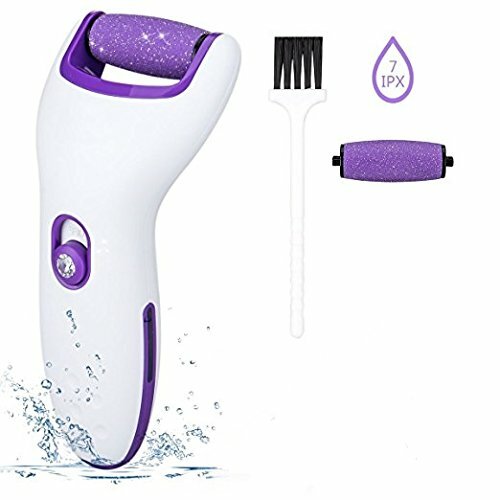 Perfect Electronic Foot File - For Wet& Dry, soft, smooth your feet in minutes: Make Gently and effectively buffs away rough, det and hard calloused skin effortlessly. Turn cracked heels into silky BABY smooth ones. Pedicure Tools Professional -1XRegular Coarse roller head & 1x Coarse Roller Head -They spins 360 degrees for quick results on thick,callused feet and heel,and Fine soft skin. Electronic Foot File Callus Remover-Effective to remove dead skin from feet for the perfect pedicure at home,Spa Quality. Portable foot file Pedi : non-slip handle secure grip wet and dry. Lightweight design to carry for travel so convenient. 30 Days Money Back Guarantee and 2 Year Quality Warranty. Rechargable Foot File : No need batteries any more. Just recharge the electric foot file cordless with provided USB cable. If you have any questions about this product by ZoiyTop, contact us by completing and submitting the form below. If you are looking for a specif part number, please include it with your message.